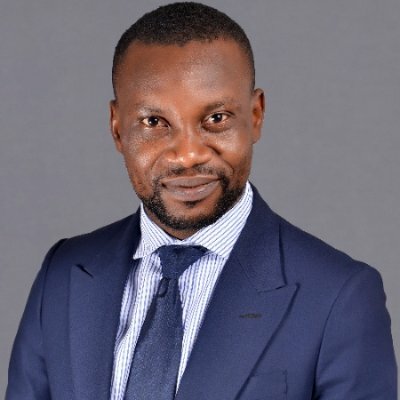 From a review of 257 employment cases decided by Nigeria courts, 17 by Canadian courts and 81 by the English courts, I have observed that the relationship between an employer and a worker neither starts nor end with equal bargaining power notwithstanding that it is created and determined by mutual agreement. The employer will always have an advantage over the employee. One of the most apparent instances of such inequality of positions is (or what used to be) the employer’s power to hire and fire a worker for good, bad or no reason at all. This was so for many in years in simple employment contract. However, the law is constantly changing to ensure a greater level of protection for the workers. Times have changed in labour relations. The employer’s power to hire and fire for bad or no reason is no more without financial consequence to the employer. For an employer to validly terminate a contract of employment, the employer is required to do so for a reason, and of course, a good reason. 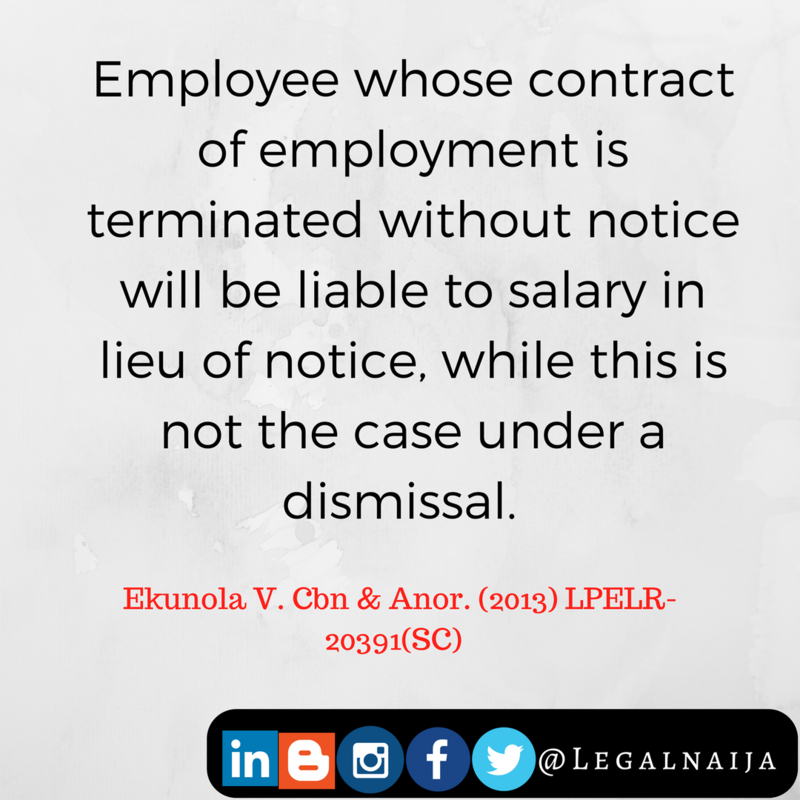 An employer is also required to state the reason in the letter of termination of employment. This requirement holds in all employment cases, whether the employment enjoys statutory protection or is that of a master-servant kind. 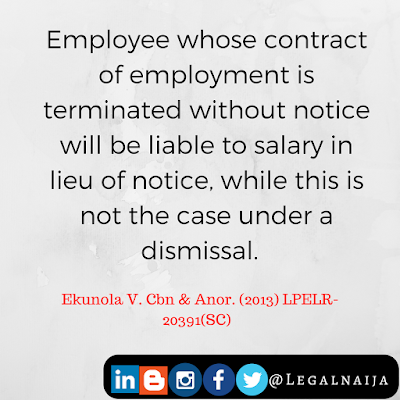 Under the Nigerian labour law, every employment contract can now only be terminated with cause –and a good cause. An employment which is terminated without any stated reason is presumed to have been terminated without good cause, and, therefore, unlawful. For instance, in a decided case, the court held that a termination of employment was wrong as it was not done with any reason. The letter of termination of the employment was reviewed. It contained nothing on the reason for the termination of the employment except “your services are no longer required”. The court held that “services no longer required” is not a valid ground for termination. Where an employment is terminated for a reason, the law imposes a duty on the employer to justify any reason given for the termination. Usually, if the reason stated in the letter of termination is disputed by the worker, the employer must then prove to the Court during trial that, indeed, the worker was justifiably disengaged. What amounts to credible evidence depends on the facts of each case, the law of evidence and other procedural laws as well as the judicial discretion of the presiding judge all of which involve intricate and complex balancing. For instance, in between one Nwako and the First City Monument Bank Plc¸ the Claimant, a branch manager of the defendant bank, was dismissed for releasing ATL (Authority To Load) to a customer of the bank without any cash lodgment, thereby causing the bank a loss to the tune of N24,806,550.41. In justifying the reason for the Claimant’s dismissal, the bank tendered during trial, and the Court was satisfied with, the relevant Credit Appraisal Memorandum, the offer letter of credit facility and the provisions of Credit Guidelines and Sanctionable Offences Policy of the bank which the Claimant ought to comply with before releasing the ATL as well as evidence of the Claimant’s failure to comply with them. The National Industrial Courts in Nigeria are now required by law to take cognizance of international best practices in labour relations when deciding matters on employment disputes. This implies that a decision of an employer to terminate a worker’s service must be reviewed by a judge against international best standards in labour practice around the world. Interestingly, this legal requirement once again restates the need for lawyers and judges (as well as employers) in Nigeria to be abreast of any developments in labour laws of other countries of the world. Where a reason stated for disengaging a worker is bad or inconsistent with any labour law, convention, treaty or international best practices, the employer will be liable for wrongful termination. It is however unclear and, therefore, arguable if Nigerian court will accept as international best practice a singular event or precedent which has not enjoyed consistent judicial restatement in the international jurisdiction. In any event, it is advised that corporate bodies should keep proper records of all disciplinary decisions against a worker in the event that it later becomes necessary for the employer to justify the reason for termination of the worker’s service. An employer is no longer allowed to fire a worker without stating the reason why the worker is being fired. The letter of termination of employment must state the reason for the employer’s decision to end the worker’s service –and the stated reason must be a good reason. The list of reasons for which an employer may disengage a worker is a fairly long, perhaps an endless one. It is difficult to determine what reason will suffice for every employment relationship. Nigeria courts usually determine reasons for termination of employment on a case by case basis, being guided by the terms of the employment contracts (particularly the details of the employee hand book or employer’s disciplinary procedure), industry practice, international best practice and the facts of each case. 10. Any other reason stated in a contract of employment. Exemplary Damages is the remedy for terminating employment without cause or for bad cause. Generally, a worker who is aggrieved by an unlawful termination of a simple contract of employment can only apply to the Court for damages, not reinstatement. Damages is a monetary compensation that is awarded by the National Industrial Court for wrongful termination of employment. No worker can be reinstated by a Court to a job from which he or she has been disengaged, however bad the procedure for termination, unless the employment is regulated by some statutory procedures. An unlawfully disengaged worker, if successful in an action against the employer, may be awarded the amount representing his salary for the agreed length of notice for termination and, in some cases, exemplary damages, in addition to any outstanding or terminal benefits due to him or her. Nigerian Court usually does not award general damages in employment litigation except exemplary damages. Exemplary damages may be awarded, as the court deems fit, to a worker whenever the employer’s conduct is sufficiently outrageous to merit punishment such as where the company was malicious, fraudulent, cruel, insolent to the worker or acted in flagrant disregard of the law or an acceptable international best practice, in dealing with the worker. It should be noted that in awarding exemplary damages, the Court would be satisfied to award the amount claimed (or a lesser sum in deserving circumstances) upon proof that the employer did not give any reason or comply with the law or an international best practice in terminating a worker’s contract of employment.